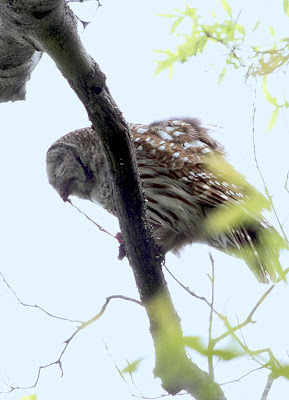 Also known as the "hoot owl", we have two barred owls in our neighborhood. 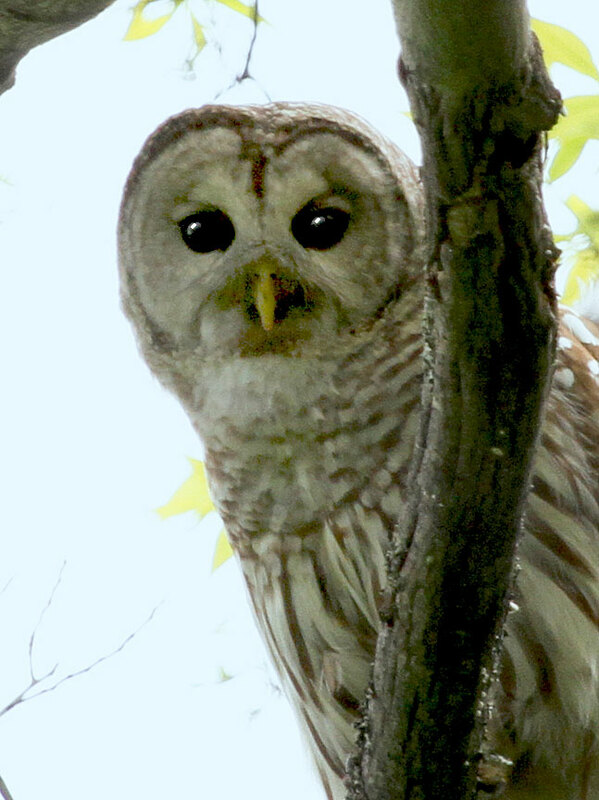 We can hear the familiar "who cooks for you, who cooks for you all" hooting at night as well as in the daytime. Barred owls have many calls, including one sounding like raucous monkeys. The male's voice is said to be deeper and mellower than the female but I can't tell the difference. 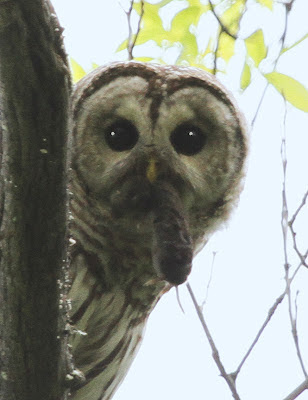 is that a vole in your mouth? 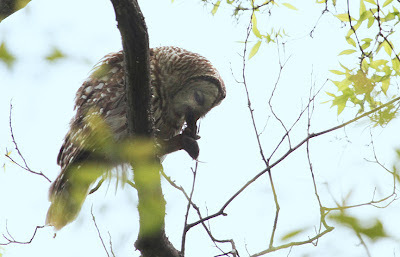 Even though this owl is well camouflaged, it seems whenever we're near, he silently glides away. It might have something to do with the fact that our hikes in the woods are accompanied by three rambunctious dogs who love to chase squirrels. 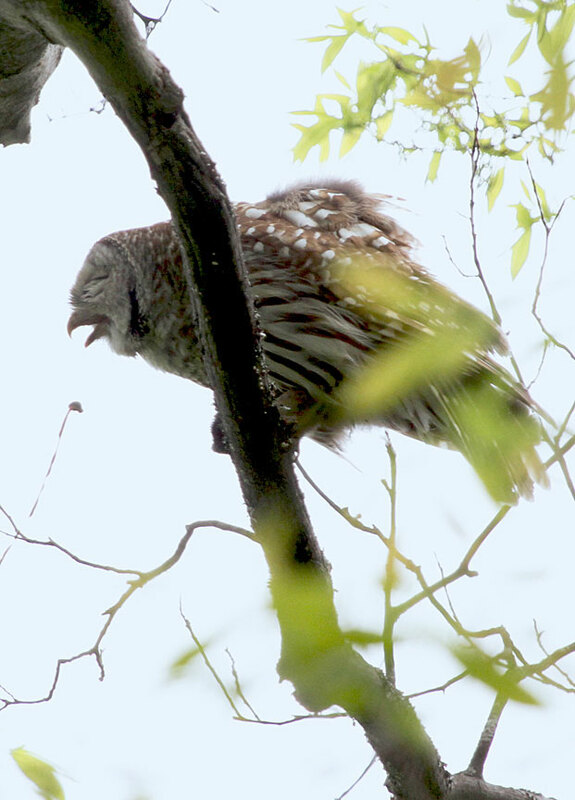 Owls have specialized feathers with fringes of varying softness the help muffle sound when they fly. Their broad wings and light bodies also make them nearly silent fliers, which helps them stalk prey more easily. This day we spotted him with a vole. A Barred Owl will use a perch, from where he dives upon its prey - meadow voles are his favorite, followed by shrews and deer mice. Others include rats, squirrels, young rabbits, bats, moles, opossums, mink, and weasels. 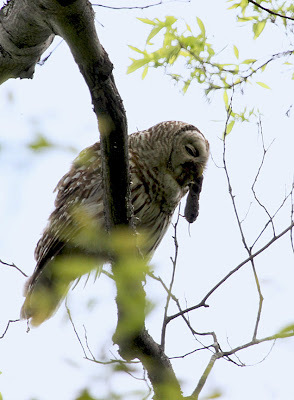 Birds are taken occasionally, including woodpeckers, grouse, quail, jays, blackbirds, and pigeons. They also eats small fish, turtles, frogs, snakes, lizards, crayfish, scorpions, beetles, crickets, and grasshoppers. Owls have zygodactyl feet with two toes pointing forward and two toes pointing backward. This gives the birds a stronger, more powerful grip so they can be more effective predators. Watching a predator eat its prey is not for the feint of heart. He'll eat every part of his catch and later regurgitate a pellet of indigestible material such as the bones and fur. 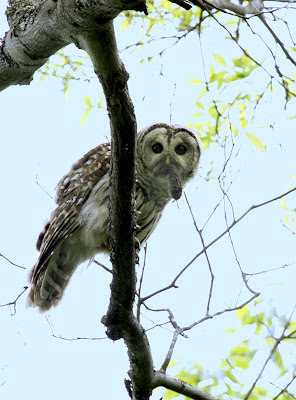 An owl has three eyelids: one for blinking, one for sleeping and one for keeping the eye clean and healthy. Not sure what one he's using here. 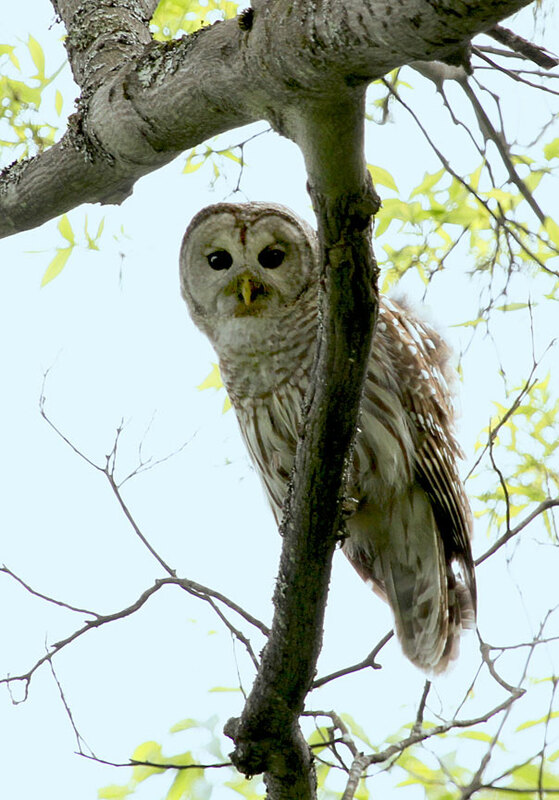 An owl's eyes are supported by bony eye sockets and they cannot turn their eyes. Instead, owls rotate their heads up to 270 degrees, but they cannot turn their heads all the way around. The barred owl is one of a few types who have dark brown eyes, most have yellow eyes. What great shots. My favorite owl. Wonderful photos. Didn't know that Owls eyes are fixed in place and that's why they turn their heads almost all the way round.